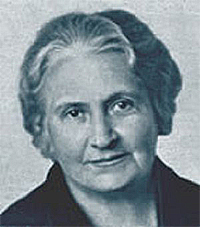 In her method, Dr. Maria Montessori envisioned a new role for the teacher. We often refer to her as a guide or director, because the teacher does not teach in the traditional sense. It is the children who teach themselves through activity, while the teacher’s role is to direct, stimulate and guide this activity. The students are introduced to materials through careful demonstration, or “presentation”. The teacher slowly and precisely uses the material in its intended way while a child or group of children watch. During such presentations unnecessary words and movements are avoided and actions are broken into discernible steps to increase understanding and the chance for success when the materials are used later. The decision to do a particular lesson or presentation results directly from observation from and assessments of the child’s work. The teacher, may then re-present some materials or exercises to show variations or extensions, or to help the student learn new information or terminology. Curiosity and the child’s ability to learn effortlessly and concretely allow the Montessori teacher the opportunity to introduce multiple subjects for the child to discover and explore. In the Montessori classroom, the space is divided into several logical areas by low open shelves: one for practical Life exercises, one for Sensorial, one for Language, another for Math and other areas for Art, Music, Geography and Science. The Montessori Curriculum is an integrated thematic approach that ties the separate disciplines together into studies of the physical universe, the world of nature and the human experience. In this way, one lesson leads to many others. Each material isolates one concept or skill that has been specially designed in a way that children are naturally drawn to want to work with it. Each material has also been designed so that a child can check his own work; we call this a built-in “control of error.” The intention of the materials is not to keep the children dependent on these artificial learning aids forever; they are used as tools to help children work and learn at their own pace, to see abstract ideas presented in a very concrete, three-dimensional way and to help them grasp and understand what they are working on. Montessori students learn not to be afraid of making mistakes. They quickly find that few things in life come easily, and they can try again without fear of embarrassment.